At Santorini, we are more than just a team.We are a family of talented, diverse individuals. We believe that every part of our team is as important as the next. Each person with their own history, their own unique qualities and their dreams. We would like to share our wonderful family with you. Heidi grew up in Sussex, England. She has a twin brother and 2 other siblings. Her family is very important to her and she is very close to them all. She started her first job in a coffee shop at age 15 and she fell in love with hospitality, service and working with people. She loves to travel and experience new cultures especially the food. She especially loves Asian style food and is also a chocoholic. She enjoys cooking homestyle dishes for lots of people. Heidi used to dance competitively in ballroom, latin and freestyle. She is also a qualified beauty therapist. From PE, South Africa, Wynand grew up in a large family with lots of sisters. He always had a passion for cooking and great entrepreneurial skills, combining the two by baking muffins and selling them for extra pocket money during the holidays. He spent two years working and travelling around the UK and this was where he first stepped into the kitchen as a chef. Although he creates wonderful fine dining dishes, his personal favourite is simply lamb chops on the braai. At Santorini he has taken on a new challenge in his career and has become an integral part of our team – although still very involved in the kitchen. 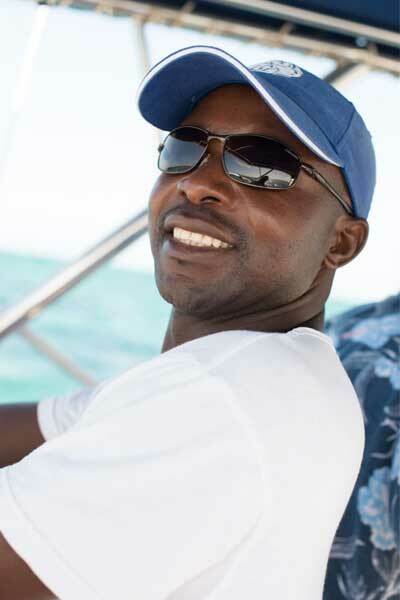 Felizberto is from the Zavala district in Inhambane. He is married and has 18 children, 14 grandchildren and 6 great grandchildren !!! He is a dedicated Evangelical Christian and will be graduating to be a Church Pastor later this year. 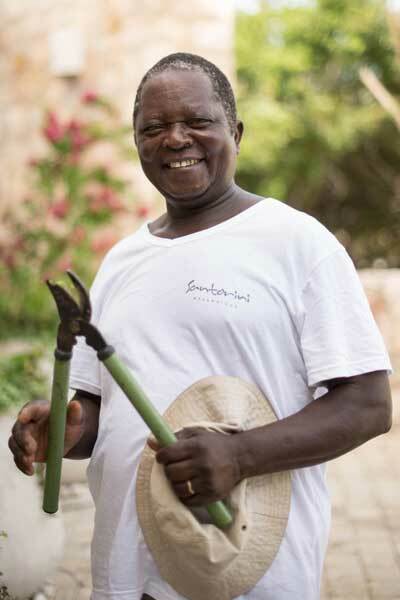 Felizberto’s gardening experience does not end at Santorini, he is the proud owner of a veggie garden supplying his fellow colleagues and his village. He enjoys spending time working in the garden in his spare time with his grandchildren. He hopes to get his driver’s license to buy a tractor and work in his fields one day. Zulmira, otherwise known as Mira was born in Vilanculos but grew up in Maputo where she got most of her education. She completed her High school in Vilanculos. 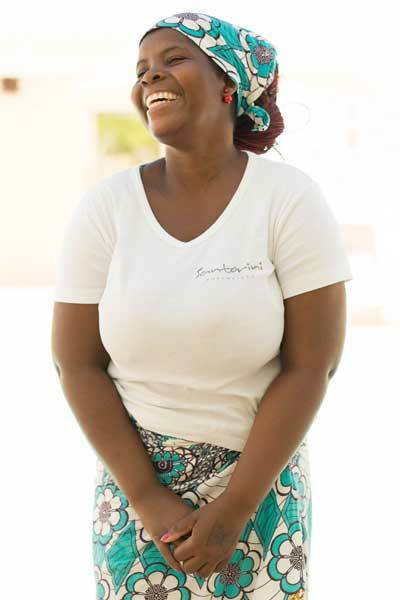 She has always wanted to work in the Hospitality industry and so she started working on the islands as a waitress, She then managed to work her way up to become the housekeeping supervisor at one of the main island Lodges. Mira enjoys people, she is outgoing and loves dancing, music, being with friends and spending time with her two boys. She attends the local Catholic Church in Vilanculos. Her dream is to become one of the best Spa Therapists. Paulino grew up in Vilanculos. He was born into a large family of ten – five brothers and five sisters. 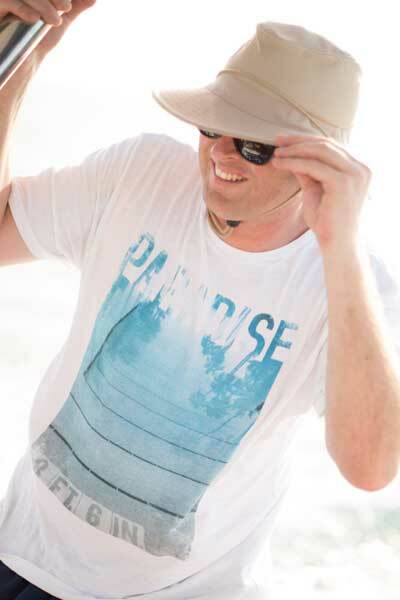 His favourite sport is fishing and he also enjoys watching music videos, his favourite artist being Brian Adams. The best moment of his life was when his daughter was born. Born in Vilankulos, the first of his 4 sisters and 4 brothers. He is married with two children aged 16 and 4. 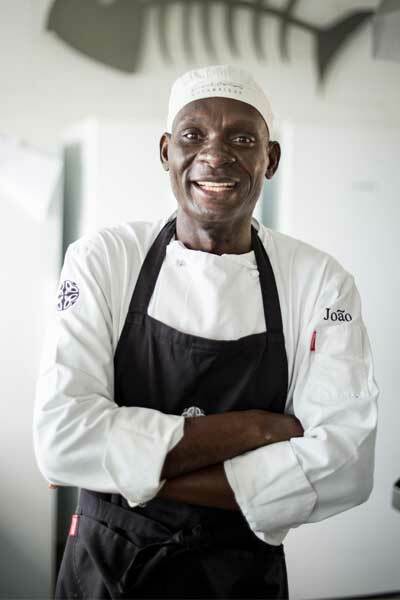 Joao learned to cook at a resort on one of the islands where he worked for 8 years developing his skills. His dream is to become one of the best chefs. Helena Maria Joao was born in Beira and grew up and went to school in Maputo, the Capital of Mozambique. 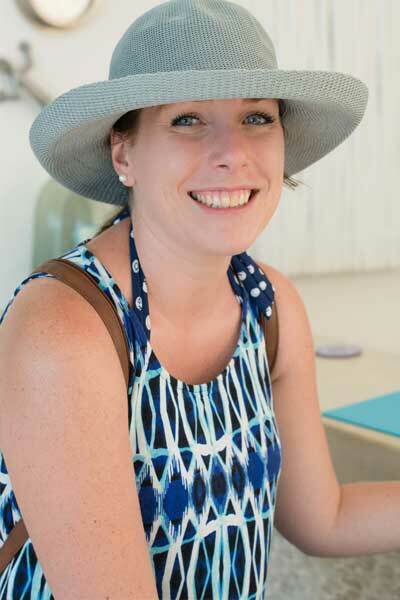 She met her husband in 2003 and was invited to Benguerra where she trained and became a Spa therapist. Within 3 months, she managed to master the English language from her Portuguese background. She has two kids, Diogo and Rafia who are 11 and 9. Nela enjoys travelling, listening to good music. As a young girl, she dreamt of being an air stewardess. She now loves to do Spa treatments. She really enjoys cooking local dishes, especially for her husband, and spends most of her free time working on new local foods and flavours. Her favourite dish is Feijoada. Adolfo is from Quenene on the San Sebastian Peninsula. He moved from his home in search of greener pastures and has never looked back. For a person who arrived in Vilankulos town with nothing but a bag of clothes and a lot of ambition he claims he is realizing his dream. 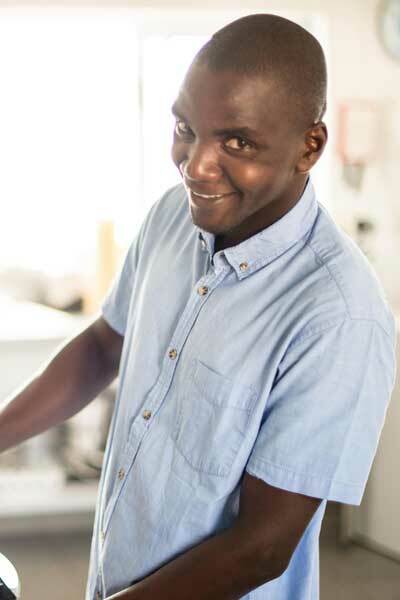 He started working at Santorini in the scullery and because of his hard working, dedication and willingness to learn he has been promoted to Assistant Chef. He recently bought a piece of land in Vilanculos and is busy building a home for his family. He is a Christian and goes to the United Methodist Church. Albertina was born in one of the villages in Vilanculos in 1976. 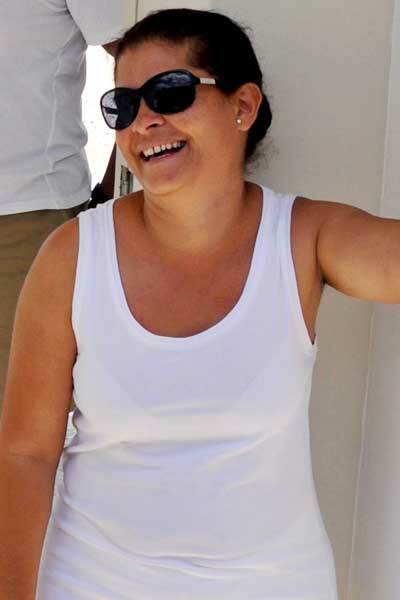 She is one of the longest serving staff member at Santorini having joined Santorini in 2011. She always beams with pride as she recounts her journey to become what she is today. From humble beginnings to one of the best Housekeepers. She loves her job and she says she would never swop it for anything different. 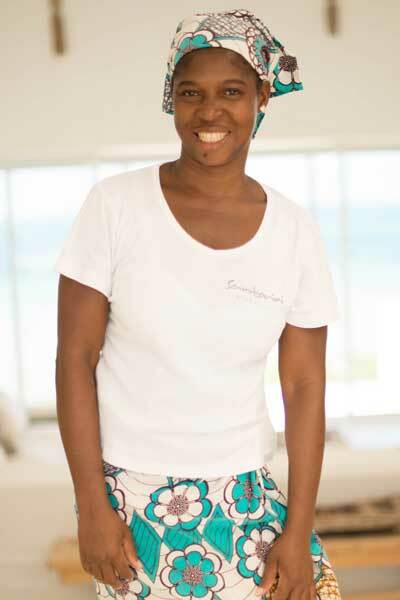 She holds a certificate in Housekeeping Ethics from a college in Inhambane. She is working hard so that she can be able to send her children to university – her life goal. She is a dedicated Christian and is a big fan and patron of the Santorini Football Club. Calistro was born on the 11th of May 1990. He is married and has 3 boys with the oldest one being 7 years old. He has lived in Vilanculos all his life. One day he wants to travel around Mozambique and also to other Southern Africa countries too. In his spare time, he enjoys riding his motorbike, he says he is an adrenalin junky. Calistro started working for Santorini in 2015. He is a peoples person and he enjoys to serve. He gets his satisfaction when his guests are happy. 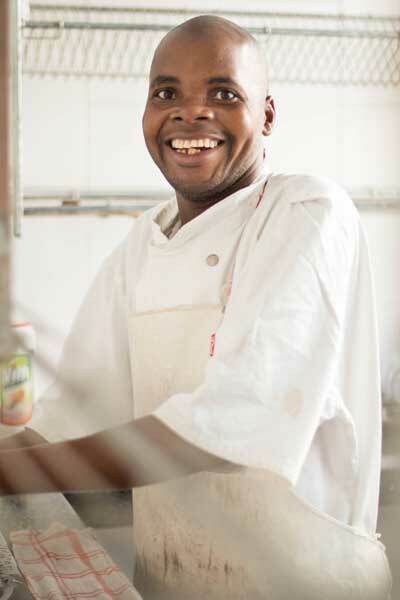 He has a passion for the hospitality industry and he dreams of one day running his very own restaurant. Tatenda was born in Mutare – the border between Zimbabwe and Mozambique. He is married with two children. His first child is in the 2nd year of Primary School. He joined us in 2015 as the company driver. He really enjoys showing our guests the best of Vilanculos on town trips and doing cultural tours. He is a dedicated Christian and enjoys reading, watching television and fishing. In his spare time, he enjoys being active. His favourite exercise is weight lifting. He has made some weights out of old engine parts and some weights made of cement and uses these to work out with daily !!! Sergio comes from Vilanculos. 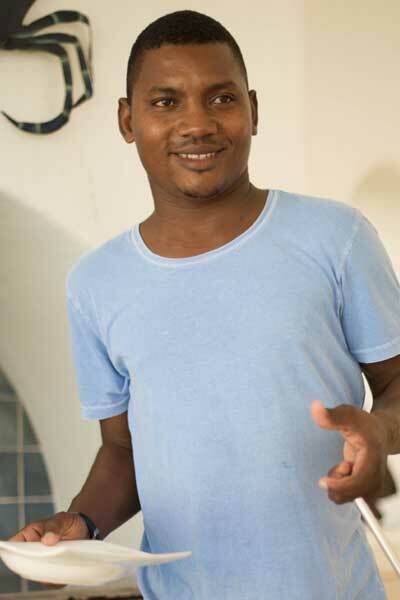 He went to school there until Grade 10 and then he moved to Inhambane to finish his schooling. 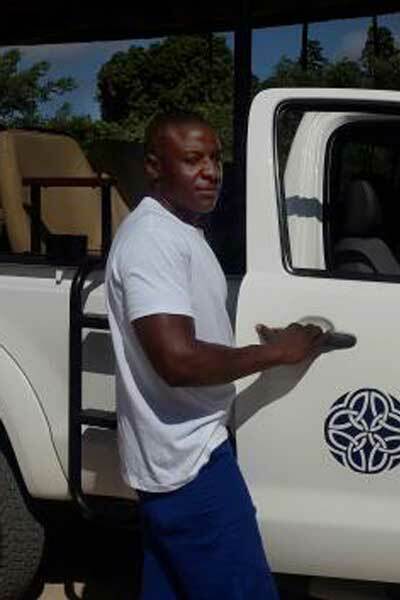 He has worked at Aguia Negra in the restaurant and also as a driver. His dream was to become an accountant. He loves to play football and to go to church. He also loves music and love to play the guitar. His favourite food is steak.